When you start Free Lyrics Finder and open a folder with songs, in most cases filenames are black on a white background. After you download lyrics for the songs, the background changes to green. Sometimes you can also see filenames on a red background. These are color masks that help recognizing situation with tags at one glance. Songs with tags (artist, title, year, album, etc.) but without lyrics aren't highlighted (the background color is white). Songs without any tags at all are highlighted with red. Songs with lyrics are green. While Free Lyrics Finder can download lyrics for files without any tags (taking information from filenames), it is recommended to use Free Music Tag Finder to identify songs without tags properly. You can adjust color masks to your requirements in the settings window of Free Lyrics Finder. You can easily create your own colors by clicking on the desired color and adjusting its intensity with the slider on the right. 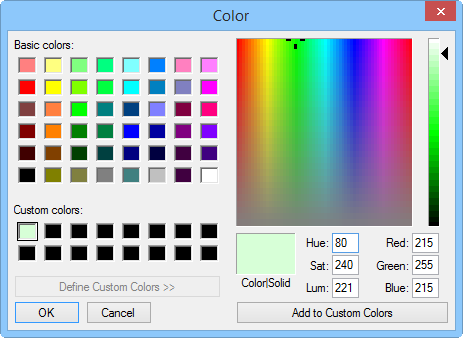 After making a new color, click the "Add to Custom Colors" button to save it. Then click "OK" to close the "Color" window. 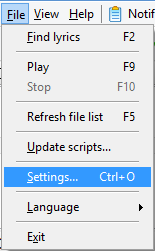 Confirm your new color settings with "OK", which will close the "Settings" window of Free Lyrics Finder.